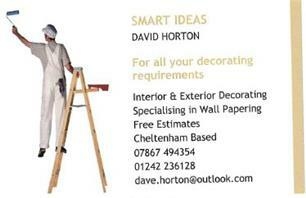 Smart Ideas - Painter/Decorator based in Cheltenham, Gloucestershire. I've been a decorator for over 22 years and take a real pride in my work. I am dedicated, flexible and able to cover all aspects of external and internal decorating required for domestic, commercial and the lettings markets. My aim is to leave all my clients happy with a top class finish at a reasonable rate. I always use dustsheets and leave everything clean and tidy on completion.